How ready is your home for a possible power surge from lightning? Warner Service wants to ensure that your home is ready this winter for the power surges. We want to keep you and your family safe. Lightning is the most common source of power surges. The natural effect creates the most powerful and damaging power surges for homes. Despite lasting only a fraction of a second, power surges from lightning are capable of carrying tens of thousands of volts through a residential electrical system. Lightning causes the most amount of electricity to enter your home, but major power surges from a thunderstorm are very rare. A bolt of lightning must strike within a mile of your home to negatively affect it. The types of power surges that are more common are smaller surges. These small surges happen almost every day from downed power lines and electrically demanding appliances (dryers, dishwashers, and washing machines). In fact, a minor inconsequential power surge occurs every time you turn these appliances on and off. These smaller power surges are also caused by power grid switching in electricity from local power plants or utility companies. To cope with smaller power surges, local electrical companies use more, smaller power stations in the middle of the day to meet the needs of your home. Every time these stations go online, a small power surge enters your home. Power surges are a risk to one of the most important parts of your home: the HVAC system. Modern furnaces, air conditioners, and other HVAC equipment have electronic systems and printed circuit boards that are highly sensitive. When a power surge occurs, the equipment can malfunction or blow out. 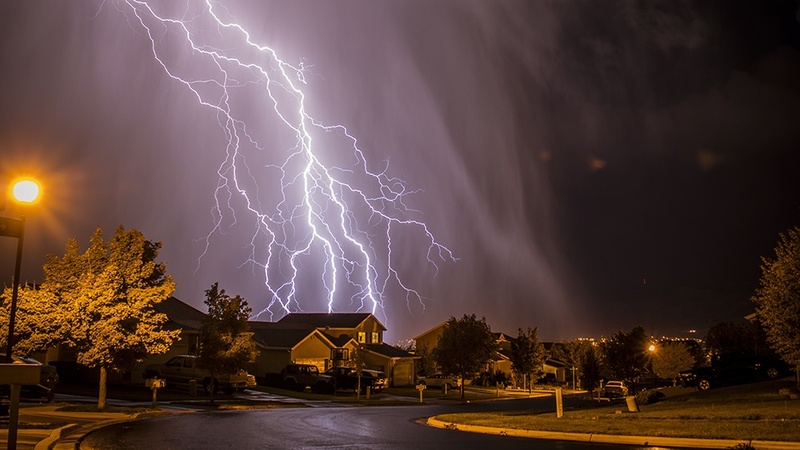 This results in an extremely expensive HVAC repair or replacement from a lightning strike. As a precaution, many updated home HVAC systems include surge protection that’s connected to your home electrical panel. This protects the system from large and small power surges by monitoring the current entering the unit. If the surge protector detects an increased amount of current, it “adjusts the floodgates” to allow only safe amounts of electricity to enter the unit. The remaining amount of electricity is absorbed and then sent to the grounding wire in your home. This eliminates the risk of damage to your home and HVAC system. It’s a security measure that prevents too much current from entering the heating unit and frying the circuitry of the equipment. Unfortunately for older homes, power surges are a more serious threat to HVAC systems. Older homes often don’t have updated HVAC systems with surge protection. If the unit doesn’t have surge protection, you can buy a surge protector for your HVAC system. It protects the functionality of the unit, prolongs its lifespan, and prevents unforeseen expenses for repair or replacement. Warner Service wants to ensure that the home HVAC system is safe from power surges during all seasons. If you have any questions about surge protection for HVAC systems, contact Warner Service to address your home.